You can purchase this mama and baby puppet set at Bonjour Petit! My son loves stuffed animals. He stacks them up at the end of his bed, takes one with him on every car ride, and brings one in his bookbag when we’re visiting friends. He’s even asked to take them to school, which is of course is usually a no-no unless they’re having a special event where it’s deemed okay (like Pajama or Movie Day). 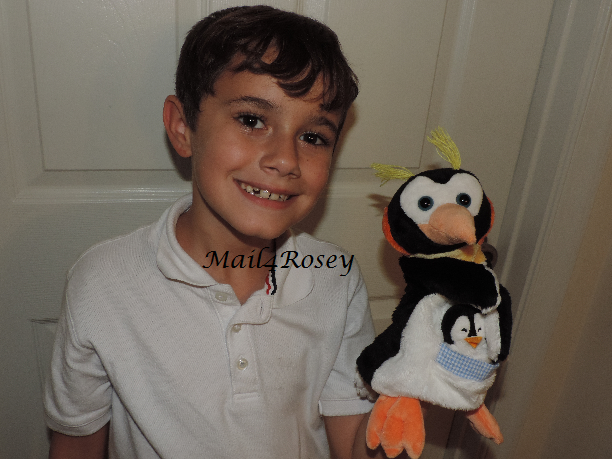 When this little puppet arrived, he was a very happy young man because he did not yet have a penguin in his stuffed animal collection, nor did he have a puppet! Now, very happily, that is no longer true. There are other types of animals available too, so be sure to swing on over and check them out (I’m thinking the koala set I saw would be a great addition at some point, he’s a real cutie pie and our penguin puppet would probably love to have a puppet friend ;)). The mama is a puppet and the baby is a finger puppet! The Trudi Puppets are unique because they have a mom with a baby tucked away in their cute little front pocket. The mama is a hand puppet, and the baby is a finger puppet, so tons of role play could take place with this one too. Believe me, that’s definitely going on here, my little one is the king of role play. In fact, right now he’s sound asleep but his stuffed animals, including the cute Trudi puppet are all lined up in the dining room, waiting for the day to start so they can attend breakfast. After breakfast he’ll put them back on the bed, to wait for the next thing he decides to do at some point during the day. It’s cute, and I’m going to miss when he outgrows such things. The covering of these puppets is the softest of soft…the kind you just like to reach out and touch, but one great thing about them is that they don’t shed!! The fur stays put, just like it should, and that’s a big deal to me. I’m not surprised though, Trudi Puppets are definitely top of the line when it comes to quality. I know it’s shopping season now (hey, it’s official today, right? ), so I do want to say this would be an amazingly awesome gift idea to consider for anyone on your holiday shopping list. The Trudi puppet line is just the right size for little hands, and bigger hands too. I can get my hand in there easily to play, my 8-yr.-old can get his hand in there, and my 2-yr.-old sweet baby granddaughter can get her little hand in there as well. It’s a really safe, fun and imagination-inducing toy for everyone to enjoy… and we do! This and other great toys can be purchased instantly online from Bonjour Petit http://www.BonjourPetit.com, where gift-wrapping and free shipping over $75 are available. Launched in January 2015, Bonjour Petit is an online retailer whose French/American team is dedicated to bringing the finest toys from Europe to the United States via importer Magicforest. That is so cute! I love that it comes with that cute little baby. This is such a cute puppet set! I love that the baby is a finger puppet! My kids used to love putting on puppet shows for me. The puppet is adorable. My twin granddaughters will love this. I can't recall every hearing of Bonjour Petit. I'll have to check them out because I know the kids would love to have one of those mama and baby cuties. These are so cute! Allison used to love things like this. I am very sad that she'd outgrown them, but I do have nieces and nephews that would love it! And, that's great about the no shedding! I remember playing with puppets when I was a little girl! It was so much fun! Puppets are great toys for children to foster their creativity! My daughter and her friends used to put on intricate puppet shows for us. Puppets are so fun. This mama and baby penguin puppet is one of the most adorable stuffed animals I've ever seen. I can think of several children on my Christmas shopping list that would love this! I am having the hardest time figuring out what to get Savannah this year. She is young enough she doesn't have a list. She doesn't have a need for anything either, so I am stumped. These are adorable! That is adorable. I am amazed at how many kids are finding joy in puppets! I love this...it's so cute that it comes with a baby!!! How sweet! Aww that is so cute! I love that it comes with the smaller baby one. How adorable! My daughter wouldn't mind having a puppet set like that. I'll have to keep this in mind for sure. I love this puppet. It is so cute and a mama and her baby. 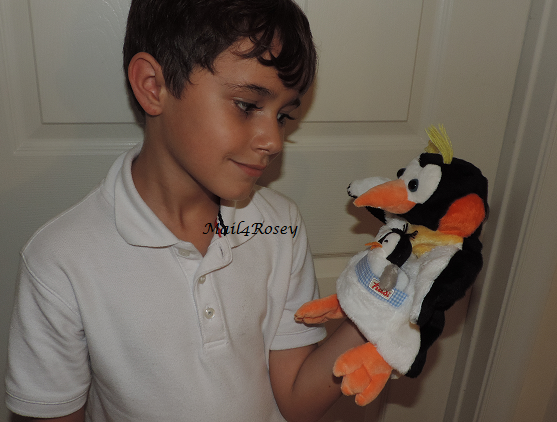 My niece loves penguins and she would adore this puppet. That is just too cute. My little one LOVES puppets. He gets such a kick out of them. Oh my goodness, this is so cute! i am going to have to look into getting this for the kids I nanny for - they would be thrilled! These are just so cute! I will keep these in mind for holiday gifts. So cute! Would make such a great gift this holiday season! I love puppets, I will look into this for Christmas! I have a penguin obsessed daughter. She has to have this! Oh those are adorable. I think they'd make wonderful gifts. They'd be fun for kids of all ages! This is super cute and my daughter LOVES penguins so I'm sure she would get a kick out of this puppet set! I haven't heard of Bonjour Petit but definitely checking them out now! My little cousin would really love this, especially because it comes with a little baby penguin. It looks super soft too. How cute! My daughter would love this. Great idea for Christmas for her. Oh! oh! Oh! I love this so much. I love to play puppets with my kids and the addition of the sweet little finger puppet is brilliant! So stinking cute! I love puppets and these are two really cute ones! I think I need it too! Oh my goodness, this is just too cute. I want one.